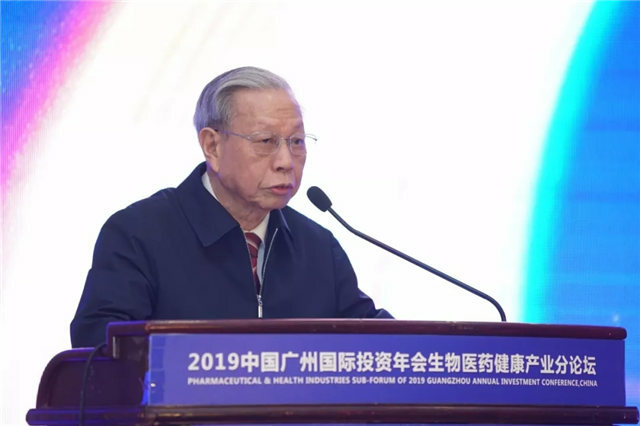 The pharmaceutical and health industries sub-forum of the 2019 Guangzhou Annual Investment Conference (GAIC) was held at Guangzhou’s Baiyun International Convention Center on the morning of April 3rd, with the theme of ‘celebrating the 70th anniversary of the People’s Republic of China, jointly developing the Guangdong-Hong Kong-Macao Greater Bay Area’. 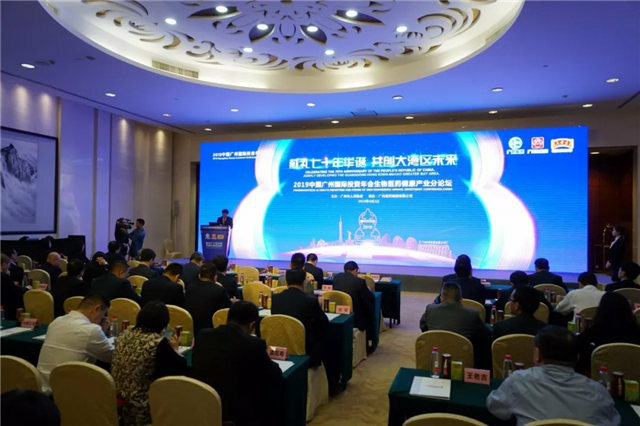 Over 100 guests, including tycoons from the pharmaceutical and health industries, attended the forum and discussed how to enhance cooperation in the field of medicine between regions in the Guangdong-Hong Kong-Macao Greater Bay Area. The keynote speakers were Deputy Secretary-General of Guangzhou Municipal Government Gao Yueyu, TCM masters Xuan Guowei and Zhou Daihan, Director of NMPA Southern Medicine Economic Research Institute Lin Jianning, Head of Guangdong 999 Brain Hospital Zhu Dan, Partner of Shanghai Deloitte Tax Ltd. Shenzhen Branch Li Feng, and GPHL’s Chairman Li Chuyuan. Gao Yuyue, Deputy Secretary General of Guangzhou Municipal Government, delivers a speech. GPHL’s Deputy General Manager Chen Ning presides over the forum. 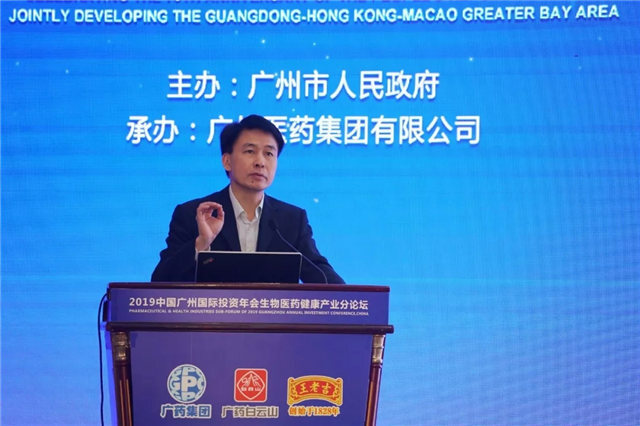 Li Chuyuan expressed his view that the pharmaceutical and health industries are important parts of the Greater Bay Area development in its outline development plan. GPHL will seize the opportunity to develop its core business Grand Southern TCM, Grand Health, Grand Commerce and Grand Medical Treatment as well as its e-businesses, finance and medical apparatus. 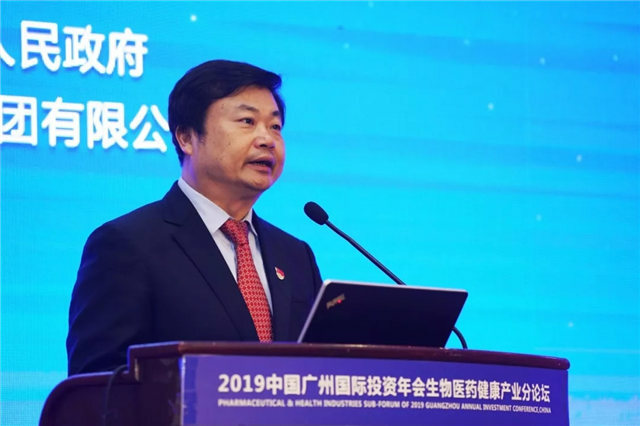 By 2020, GPHL will become a world-leading pharmaceutical and healthcare enterprise, integrating pharmaceuticals, medical care, healthcare products, healthcare services, commerce and logistics, as well as being listed in Fortune Global 500, Li stated. GPHL’s Chairman Li Chuyuan delivers a speech. 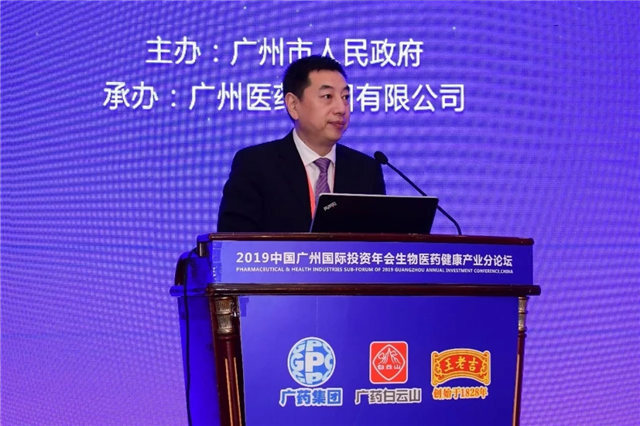 Lin Jianning forecasted that sales revenue in the medical industry is projected to increase by 14.2% in 2019 unless faced with unexpected difficulties. 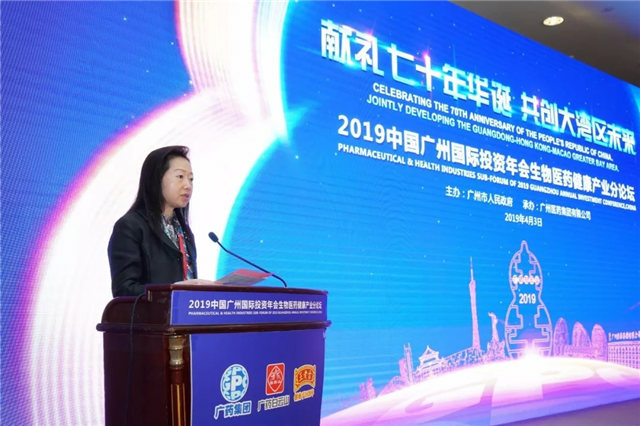 Pharmaceutical enterprises will face many challenges this year, including pressure from environmental protection rules, drug price reduction, and international competition, said Lin. Lin Jianning, Director of NMPA Southern Medicine Economic Research Institute, delivers a speech. Li Feng mentioned China’s reform of national and local taxation to create a more efficient, unified tax collection system in the past year. 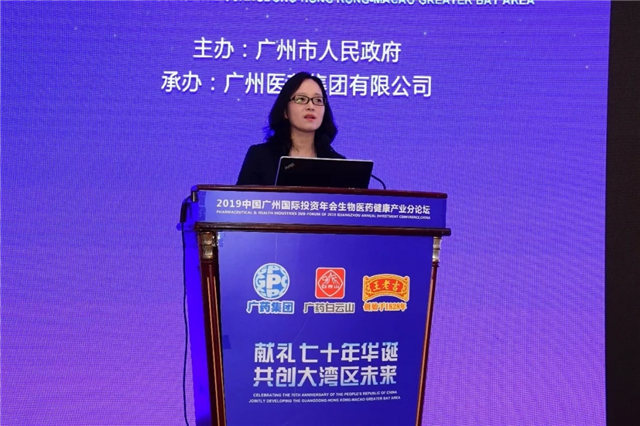 She suggested that the pharmaceutical and health enterprises in the Greater Bay Area should study and tailor their businesses to suit the new tax policy in order to enjoy the benefits. Li Feng, Partner of Shanghai Deloitte Tax Ltd. Shenzhen Branch, introduces China’s new tax policy. Zhou Daihan is the head professor of Guangzhou University of Chinese Medicine and director of the university’s tumor institute. He believes TCM will play an important role in cancer treatment in the future. TCM master Zhou Daihan delivers a speech. Xuan Guowei pointed out that TCM is set for a new round of development with the Greater Bay Area is bringing greater opportunities. 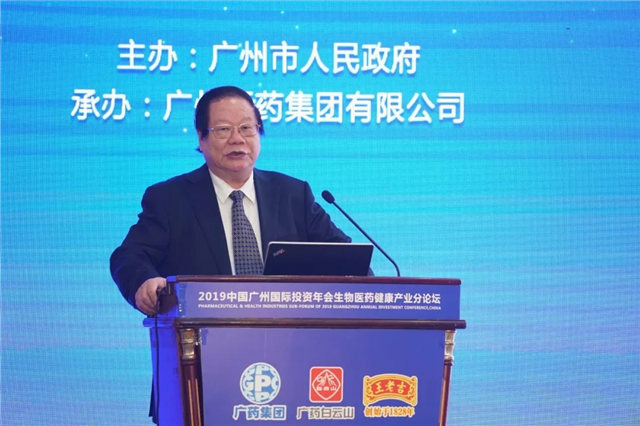 He also said that he identified with GPHL’s ‘Trendy TCM’ concept, and believed TCM should be developed with a new perspective, so as to contribute to the health of all people. TCM master Xuan Guowei delivers a speech. 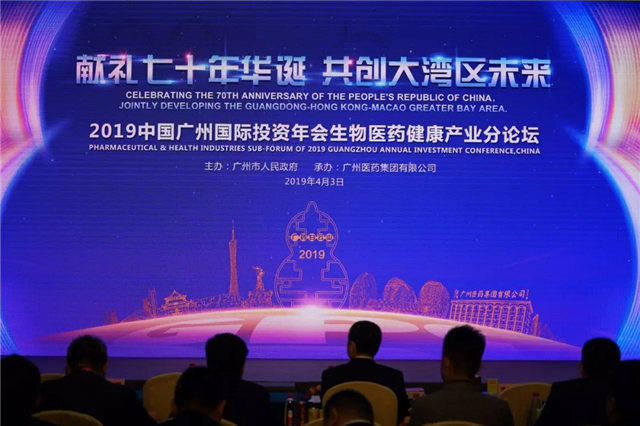 During the conference, GPHL exhibited its scientific and technological achievements, including freeze-dried rabies vaccines for human use, DNA bar code identification system for herbs, and Wanglaoji’s new products roxburgh rose lozenges & juice.